Humorous romance novels don’t appeal to me. This is a problem, since that’s what I write. I totally understand the agents and editors and potential readers seeing a description of my story and thinking, Eh, that looks like silly, annoying garbage. Big red R. Because when I pick up a book and read that it’s supposed to be funny and light and “frothy” and har har, and there’s a pink cover with a skinny Illustrator-generated cartoon female with legs like pipe cleaners wearing high heels, I hurl it down. Ick. On the other hand, my favorite books are humorous romance novels. My favorite writers produce humorous romance novels. They sell millions of copies and have gobs of fans. One key is to never say it’s supposed to be funny. Then sneak it up on them, like pie. When I write, I don’t try to be funny. I can’t help it. I actually go back and take out the funny bits, because they rob the story. They’re a tic; a spasm; a habit of voice. Too many laughs kills the tension–especially if the writers the only one laughing. But without the humor, I don’t buy any of it. Real people are funny. Not intentionally. And the only reason I write is to capture that not-intentional funniness, because otherwise my work would be what Lisa Kleypas once called (in a speech to Romance Writers of America) an empty swingset book. You know, the beige book with the picture of an empty swingset on the cover. It’s not a happy book, you know it isn’t, and I don’t want to read it. I can look in my own backyard for an empty swingset. The best writers have figured out humor and tragedy and make big–frothy–smoothies out of them and most people forget to look down on the writers for making them laugh–because they’re so good at what they do. That’s the trick with everything: do what you want, just do it really well. 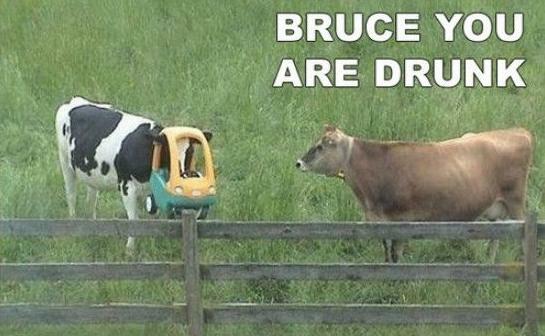 Of course, this was all just an excuse to put a drunk cow wearing a Cozy Coupe on her head on my blog.